Last Saturday morning the UAE Red Crescent Society has granted medical equipment and supplies to support Hajar hospital of the Directorate. Its efforts to strengthen health services in Hadramout and support to the health sector, which is considered the areas most affected by crises of previous services. During the handover ceremony, which was attended by the General Director of Public Health and Population Office in coastal Hadramout Dr. Riad Al-Jerairi and the secretary of the governor for relief and reconstruction Riadh Ben Taleb Al Kathiri, the General Director of the Hajar Directorate Anwar Al-Shadly, director of the Local Health office of the Directorate Arif Badaood and administrators of the Commission projects in Hadramout Shawki Al-Tamimi and Engineer Khalil Al-Tamimi. The representative of the UAE Red Crescent in Hadramout, Abdullah Almosafri, confirmed that the development of the health sector in Hadramout and strengthening the Hospital of Hajar Directorate with advanced screening and medical instruments comes within the priorities of the society to bring life to this hospital and to improve the level of services provided to citizens and ease their suffering navigation to other Directorate for examination and treatment . 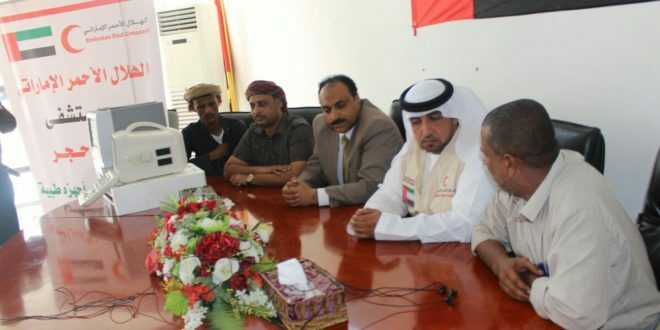 He pointed out that the Society attaches the health sector with considerable importance in Hadramout that set off in the previous initiative ‘We Care You’ which made shipments of good medicine and provide therapeutic support for many of the sick and humanitarian cases by assuming the conduct surgeries for the needy sick people and distributed many free treatments. For his part, the Director of the Local Health office, Dr. Riad Al-Jarairi praised, the significant role which is being offered by the UAE Red Crescent in the province of Hadramout health sector and various sector services in the governorate. He stressed that the society concretely and clearly contributed to improve and revitalize health services, including the infrastructure for a number of health centers and rehabilitation to besides handing Hajar General Hospital the necessary medical equipment it needs by which it suffers from shortage of medical supplies and equipment , in addition of re-maintenance and restoration of the hospital. He stressed the vital role of the Society in the restoration of this important sector of activity after it stumbled its services during the last period because of the circumstances experienced by the Hadramaut. For his part, Riadh Bin Taleb Al-Kathiri, the Governor’s secretary for Relief and Reconstruction thanks in sincerely gratitude to the UAE government and people for its infrastructure and relief projects sand ervice support. He added that the large role that accomplished by the UAE Red Crescent continuing support and who carried it upon themselves to rebuild the infrastructure in Hadramout and support to build a range of diverse projects. For his part, the General Director of Hajar Directorate, Anwar Al-Shadly, expressed his happiness of providing Hajar Hospital with tools, equipment, medical supplies that offered by the UAE Red Crescent Society to ease the burden on families from moving to the other directorate for the treatment, which takes more than three hours to reach .